The Macquarie Student Dictionary and Thesaurus Online is a package that offers a wealth of useful features. It is recommended for students aged 10 to 15 years. The Macquarie Student Dictionary provides more than just the spelling and meaning of a word. 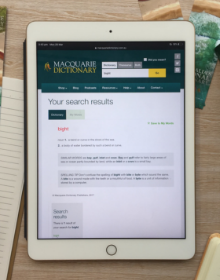 To help students develop their language skills, the Macquarie Student includes information such as advice about commonly confused words, spelling tips for tricky words, notes on how a word is used, as well as variant spellings, word histories, and more. The Macquarie Student Thesaurus is a valuable aid to students wishing to expand their vocabularies and enrich their writing. Example sentences clearly show the different shades of meaning within a set of synonyms, and the Vocabulary Extension feature invites students to explore further if they wish. Individual users who wish to access the Student dictionary can sign up for a free 30-day individual trial or subscribe here for $44.99. Prices are inclusive of GST and individual subscriptions are for 12 months. Schools have the option of choosing the complete database or the Student database. You can get a free 30-day individual trial or school-wide trial. If you have any questions or wish to subscribe for your school, please contact us.